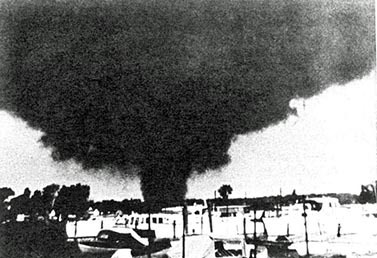 When it comes to tornadoes in the Toledo area, the Palm Sunday tornado outbreak of April 11, 1965, which killed 35 people in Northwest Ohio (18 in Lucas and Monroe counties, 13 in Allen and Hancock counties, 4 in Seneca County and 271 in the Midwest total), is unrivaled in terms of damage, deaths, injuries and storm strength. But there have been others – some forgotten, some remembered, some fresh in memory. We’ll start nearly 100 years ago. While not exactly Toledo, the Palm Sunday Tornado outbreak of March 28, 1920 did a lot of damage south and west of the city, especially in Swanton, Genoa and Raab’s Corners (in Spencer Township, Lucas County at Bancroft and Raab Rd., just west of today’s Secor Metropark). 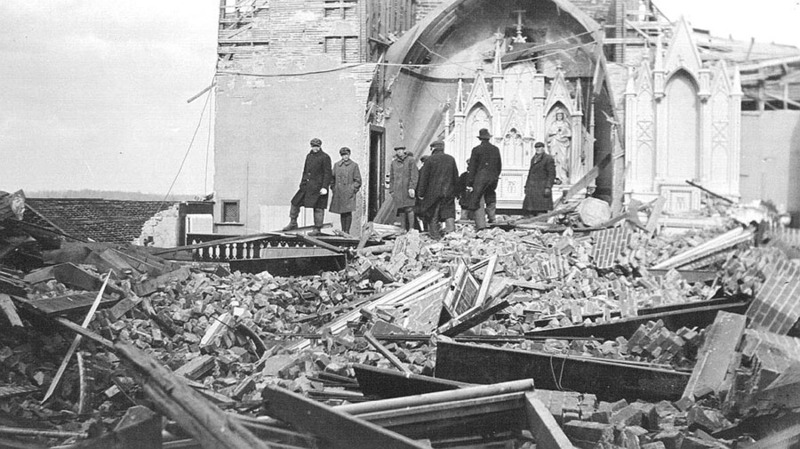 Four people died at Raab’s Corners, and the Immaculate Conception Parish church building was basically reduced to rubble. Here’s a Google Maps view of Marygrove Immaculate Conception Church, which rebuilt down the street, as it stands today. I cannot tell if it has an active congregation or not; it certainly has no internet presence. The Center for Archival Collections at Bowling Green State University says it is, and also details the church’s difficult history: the second church was destroyed by a fire, the third church was completed in 1878 but destroyed by a cyclone two years later, and the third church was destroyed in 1920. The tornadoes that struck Northwestern Ohio were part of a larger outbreak of at least 37 tornadoes that left 380 dead in the south and midwest. 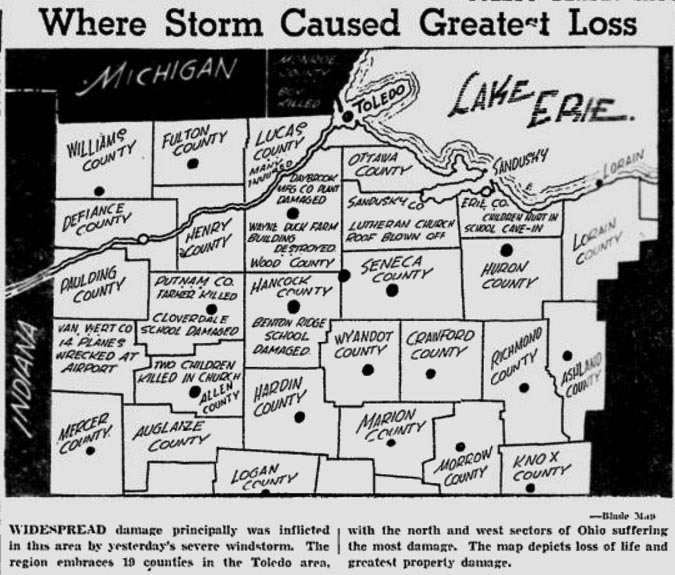 It’s a fine line, but the March 19, 1948 that hit Toledo and Northwestern Ohio may or may not have been a tornado, though The Blade uses “tornado-like twisters” to describe the storm, and weather bureau officials found evidence of “twisting tornado action” in the debris. A map of the damage left behind by the 1948 storm. While there was much damage in outlying areas, East Toledo was particularly hard hit. A Blade circulation department district manager, “without even looking hard,” came across demolished garages and barns, many trees fallen onto houses, broken windows and roofs damaged. Three of the four bridges across the Maumee River suffered some sort of damage. 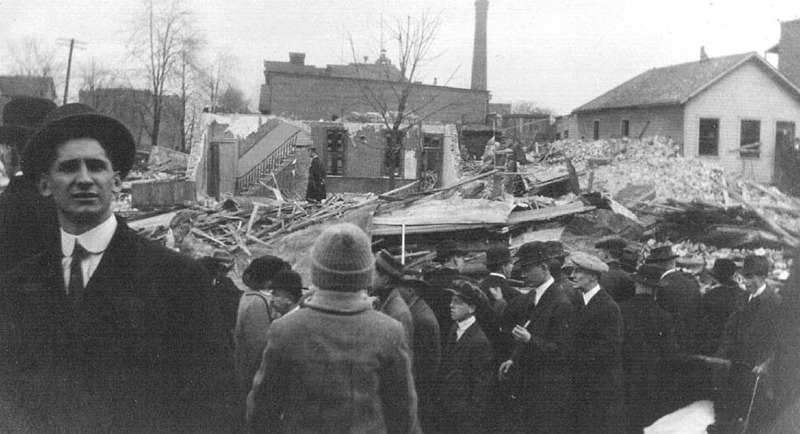 Eight barracks at the Rossford Ordnance Depot were demolished. On Oregon Rd., WSPD radio’s three 216-foot towers were blown over, with damage estimated at $100,000. Drivers on U.S. 25 between Perrysburg and Bowling Green saw a new look to their drive as all but two billboards had been blown over. In Landeck, Ohio (southwest of Delphos, in Allen County), two boys, Norbert Bonifas and Jerald Kill, were killed at St. John’s Catholic Church. They were praying the Stations of the Cross when, after being warned of the approaching storm, they ran outside and were hit by a falling steeple. A fascinating story from the Lima News about the tragedy and, in particular, the 14th station they were praying at, is here. It concerns the brother of one of the killed boys, and how the 14th station was eventually returned to the church in 2015. Since it was not officially a tornado, there are no resources to draw on to estimate the number of total deaths, though in addition to the two listed above, a man died in East Toledo at the Freeman Supply Co., 1152 E. Broadway, when the building’s roof collapsed on him. Front page of The Blade, June 9, 1953. At the time, The Blade called the storm of June 8, 1953 “the worst storm catastrophe to strike this area in its known history.” It was part of the Flint–Worcester tornado outbreak sequence, a three-day outbreak of tornadoes that stretched to Worchester, MA that killed 245. The tornado that struck was one of four EF4 tornadoes (Enhanced Fujita Tornado Scale) to hit Monroe County since 1950 (the other three were on Palm Sunday, 1965). Most of the damage was concentrated along East Temperance Road, between Lewis Ave. and Crabb Rd., as the tornado headed east into Lake Erie. Three members of a Substation Road family died when the tornado demolished their home. An F4 tornado on June 8, 1953, near Erie, Michigan, moving off into Lake Erie. Photo courtesy of NOAA via Wikimedia Commons. South of Toledo, the damage was even worse. Eight people were killed when what is believed to be an EF4 to EF5 tornado carved a path between Deshler in Henry County and Cygnet in Wood County. The tornado was so strong that structural steel of a bridge over Rocky Ford Creek on Bays Road was picked up, twisted in a knot and dropped back into the creek. Grotesque scenes of dead animals were everywhere. “In the Wood County area chickens were found plucked as clean as any to be found in any meat market,” and the details got worse from there. 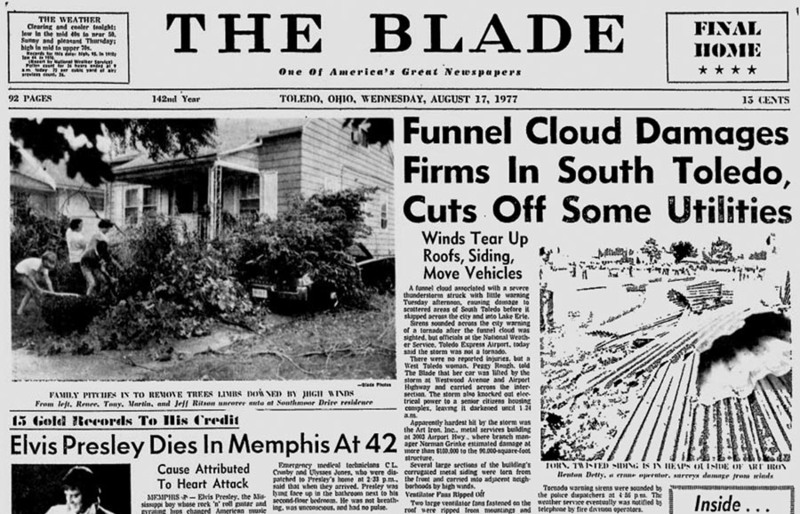 Front page of The Blade on Wednesday, Aug. 17, 1977. There was some other news. August 16, 1977. It’s a hot, humid, unsettled late afternoon. Even though it’s sunny where I am in far west Toledo, it’s evident that there are big storms nearby and almost on cue, the tornado sirens start wailing. There’s no basement in my house, so naturally the first thing to do is start looking out our big picture window and turn on the radio to WSPD-AM. Today, television meteorologists climb over each other with their Live Doppler 13000HDs and storm chaser vehicles, but in 1977 we couldn’t just turn on the TV and have someone pinpoint a hook echo (the radar signature of a tornado) down to a cross street. At best, we’d get a bulletin telling us there was a tornado warning and Mike Douglas would come back on. But any good radio station with its ears tuned to the police and fire radios could piece the situation together (especially in Toledo, where the scanner traffic was always particularly informative). The tornado was in south Toledo, generally. Then, at the height of their storm coverage and quite out of nowhere, WSPD casually reported that Elvis Presley had died in Memphis at age 42. But guess what? This storm, despite the damage it did to Art Iron, 3003 Airport Highway, and Lennie’s Plaza Gardens Tavern at 3122 Airport Highway, was not a tornado, according to the National Weather Service. Officially it was a “funnel cloud associated with a severe thunderstorm.” A tornado has to touch ground and the damage signatures were more indicative of straight line winds. Tell that to Peggy Rough, whose car was lifted up and set down by winds on the other side of the intersection of Airport and Westwood. So, not a tornado, technically. But since Elvis died that day, and I still remember where I was when I heard Elvis died (looking for tornadoes out my front window), I figured it was worth mentioning. This does not qualify as “lesser known,” but no post about tornadoes in the Toledo area would be complete without note of the Millbury tornado of June 5, 2010, an EF4 (170-175 mph winds), which is to say, a big one. The tornado skipped through southwestern Lucas County, downing hundreds of trees at Oak Openings Metropark, and went east, along and north of Ohio 795 for nine miles in Wood County. 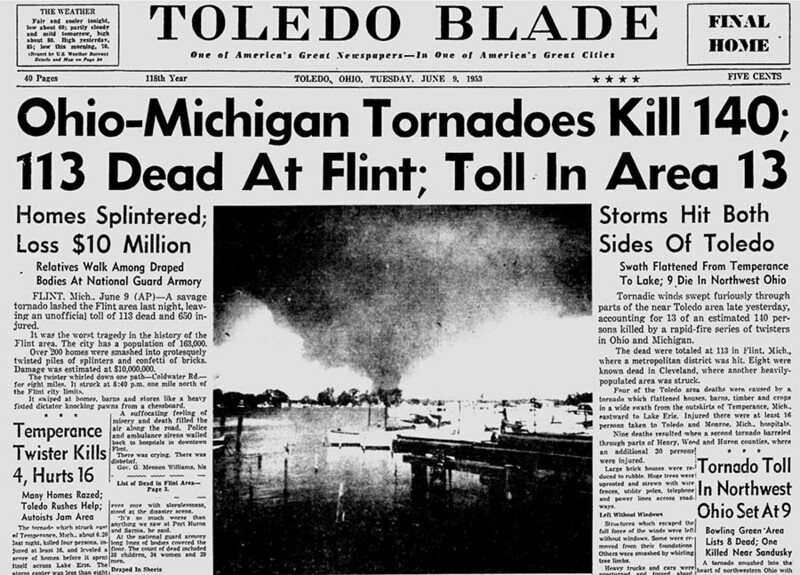 It skirted the southern edge of Toledo Executive Airport, decimated Lake High School and the Lake Township administration building, destroyed a dozen residences in Millbury, and killed seven. The Blade can cover that story better than I can, however, and did so – and followed it up a year later. Immaculate Conception Church is now part of Holy Trinity Parish in Assumption. They use I.C. as a chapel for prayer from April to October. I was a child in the 1948 tornado. We lived in East Toledo and every garage on our street except ours was blown down or severely damaged. My father and uncle built the garage and my father took great pride in the fact that it did not blow down. Some houses lost their extensions that were kitchen nooks. I remember standing with my mom by the front door while she cried and looked for my brother who was walking home from Goid Shepherd School. Boards and other debris were flying through the air. When it was all over, my brother came home. A kind woman near Oak and Fassett saw him struggling in the wind and took him in. He was only eight years old. My father was at work at the LOF plant on East Broadway and my mother could not leave the younger children. She was hysterical about my brother and was so relieved to see him alive and well. I have a series of about 8 photos that my Great Aunt took of the Cygnet, Ohio tornado. If you’re interested please email me back.